Comics aren’t just for newspapers and comic book stores anymore. The Internet has a global audience so most artists and illustrators start by sharing their comics online through image-focused social media sites, comic indexes, or sites that let them publish their work or even host their own sites. We’ve found some of the best places around the web to find comics of all different styles and genres. Webcomics run the gamut from silly, cartoony, realistic, gritty, philosophical, cynical, family-friendly, or downright strange (in a good way). Whether you love to immerse yourself in long complex stories, or if you just want a couple quick panels for a chuckle, you’ll find plenty of sites to peruse and keep you entertained. Reddit is a gold mine of information. Or a rabbit hole, depending on how you look at it. There seems to be a subreddit for everything, even art. So of course there’s a sub dedicated to comics and fans of comics! With over one million subscribers this subreddit gets a huge influx of both popular and newer, more obscure comics with lots of discussion to go with them. You’ll find some great stuff right away if you check out what’s new or hot right now on the subreddit, but the home page moves fast. Try sorting by “Top” and “All time” to see the top posts for the past week/month/year. This sub encourages artists to post their own work, so you’ll find all kinds of new stuff too. If you’re thinking of getting into drawing comics yourself this is also great place to post. As with any community, be a pal and make sure to read the rules before you post or comment. Tapas is a site dedicated to helping artists publish their work, grow an audience, and turn their work into a revenue stream. Rather than shorter strips, Tapas leans more towards graphic novels and mangas with longer, more complex stories of all tones and genres. Tapas also includes a forum for artists and viewers to discuss art-related topics if you’re looking for discussions as well. You can browse artists, graphic novels, and entire comics if you sort by newly added, popular, or by genre. If you’re into beautifully drawn, longer reading experiences then this is the site for you. Here’s another publishing platform where artists can share their work for free. 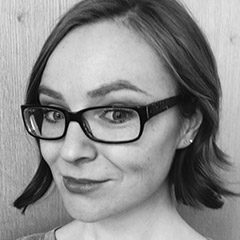 It even partners with Patreon so artists can get paid! 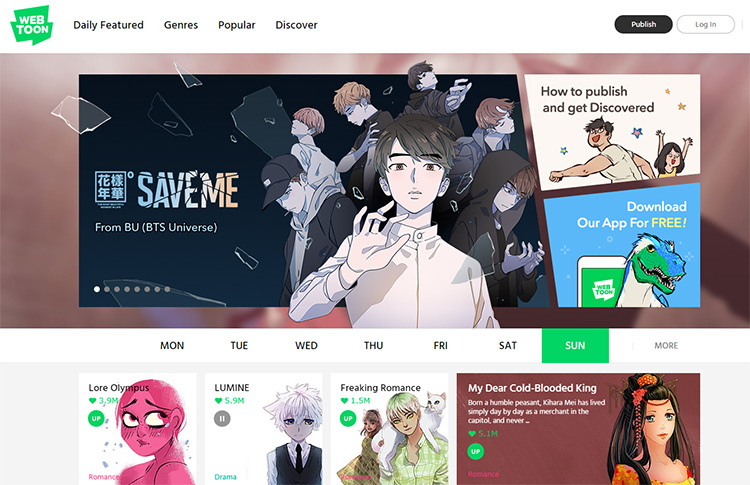 With tons of different styles and genres this site is lot of fun to browse, and it’s super easy to find new comics to get hooked on. They also have a mobile app which makes it easy to search and read comics wherever you are without eating up your data. You can even download comics to read offline if you want. Pro tip: If you have no idea where to start, check out the daily featured comics on the homepage. 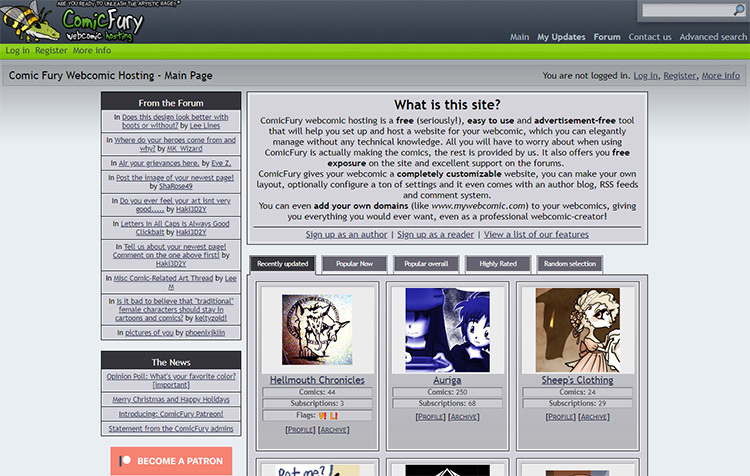 ComicFury is a publishing site and community that allows artists to share their comics and even get critiques in the forums. It’s a pretty basic site which makes it easy to search and find new stuff in different styles and genres. You can even search “random” to discover some wildcards you might not have come across otherwise. Search what’s popular now, or highly rated comics, or comics that have been updated recently. Created to help comic fans keep track of all the different comics they read, Comic Rocket is an indexing tool that allows users to bookmark their favorite comics in one place for easy access. Unlike some of these other resources, Comic Rocket doesn’t actually host the comic. Instead it sends readers and traffic directly to the artist’s site so they get all the benefits of undiluted traffic. Pretty cool right? You can effortlessly keep track of your favorite comics and save your place, all while helping out the artists. Comic Rocket is crowdsourced so users can even submit info about new comics they find on other sites. 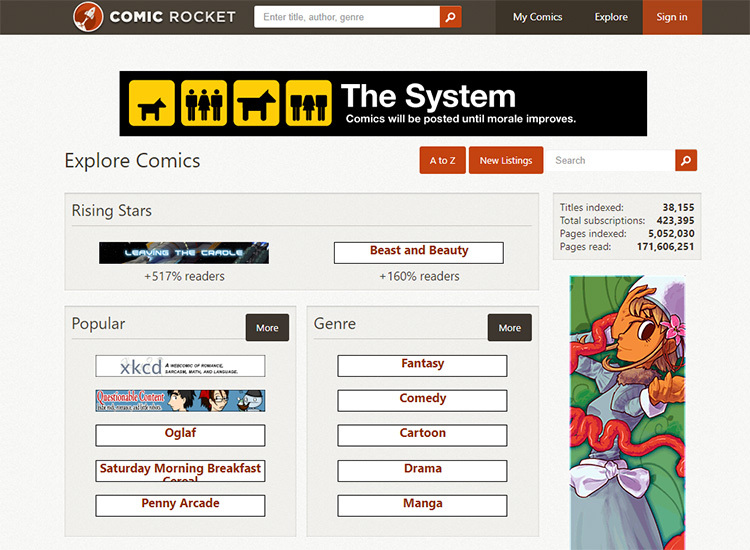 You can use Comic Rocket to find new comics and keep track of the ones you like. It also gives you recommendations based on the comics you’ve saved. 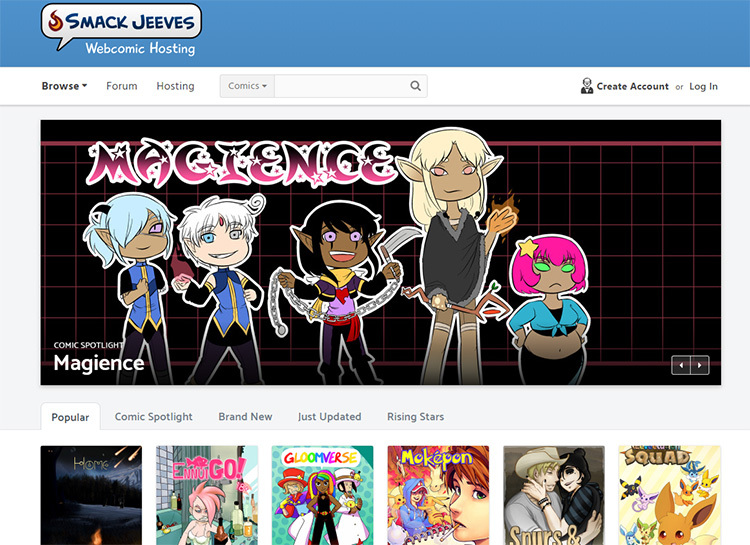 With one heck of a funny name, this is a great website to browse comics of all styles and genres. Especially if you aren’t sure what you’re looking for and just want some new suggestions. You can search by longest comics, by hashtags, newest updates, rising, or browse randomly to find new stuff you might not have considered otherwise. Viewers can also support artists via integrated Patreon donations. Smack Jeeves has a nifty mobile app too so you can read comics on the go. This is one of the oldest webcomic hosting sites around, and also one of the biggest. The Duck is unique in that it also hosts tutorials, which is great if you’re interested in creating your own webcomics. Even if you don’t want to create webcomics the tutorials could be really interesting to see how artists make their work. Just to gain a greater appreciation for the art form. 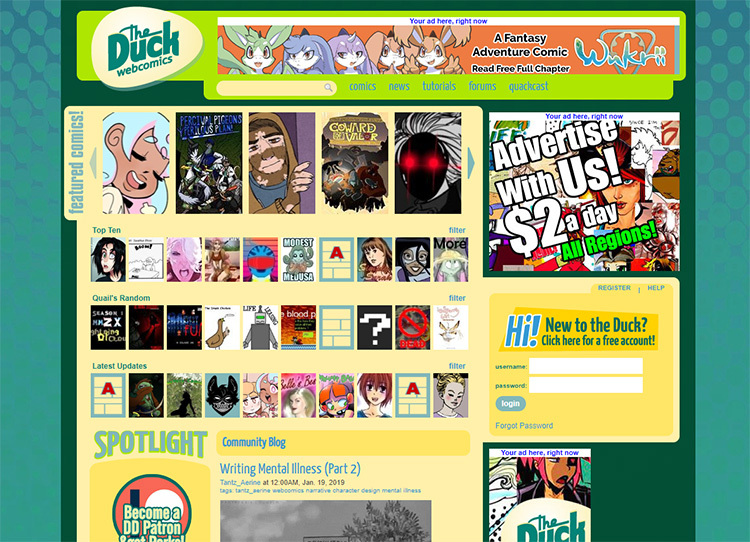 You can also check out the Duck’s podcast, forums, and merchandise shop all within the site. 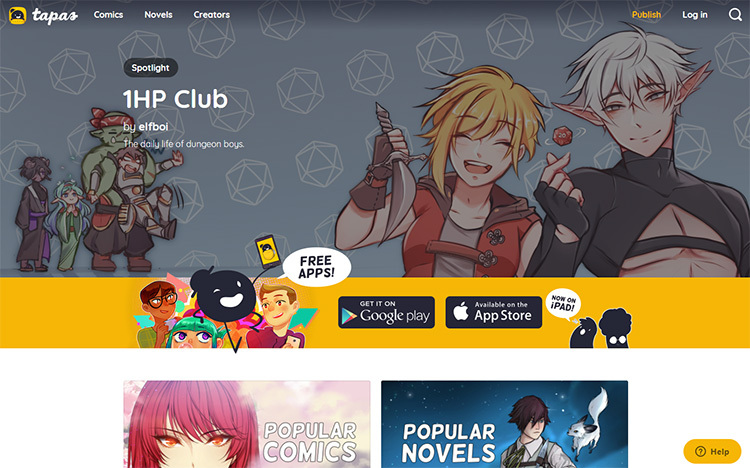 Search for strips or longer stories by topic, rating, art style, and newest publications. There’s a bit of everything here and also some of the longest running comics on the web. While not specifically a webcomic site, Tumblr is all about image sharing, so it’s a great place for artists to share their work with a large audience. 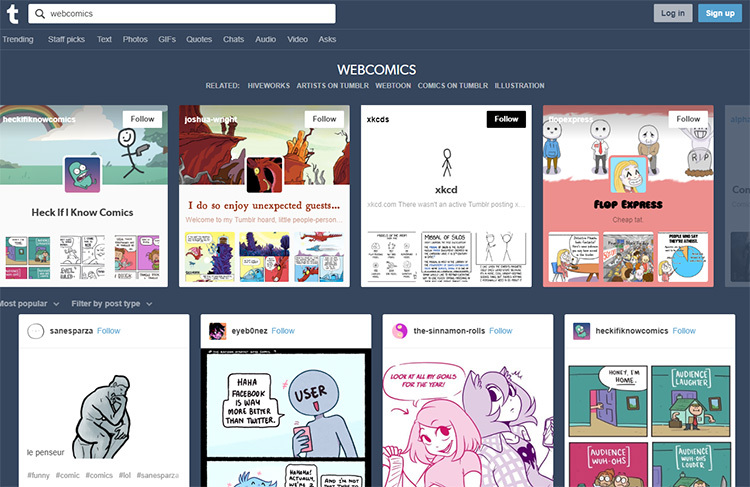 To browse comics and find tons of artists to follow simply type “webcomics”, “comics”, or other terms like that into the search bar. Tumblr tends to work better for shorter strips rather than longer graphic novel style stories. But it’s a great way to discover new artists you may not find elsewhere. Play with different search terms to narrow down your results. For example, try typing in the genre or style you’re looking for with the keyword “comic” or “webcomic”. Example: funny comics, goofy comics, etc. You’ll instantly find dozens or even hundreds of great comics in no time! Here’s another popular image sharing site where you might not have thought to look for comics. Bet let me say they are definitely on here! 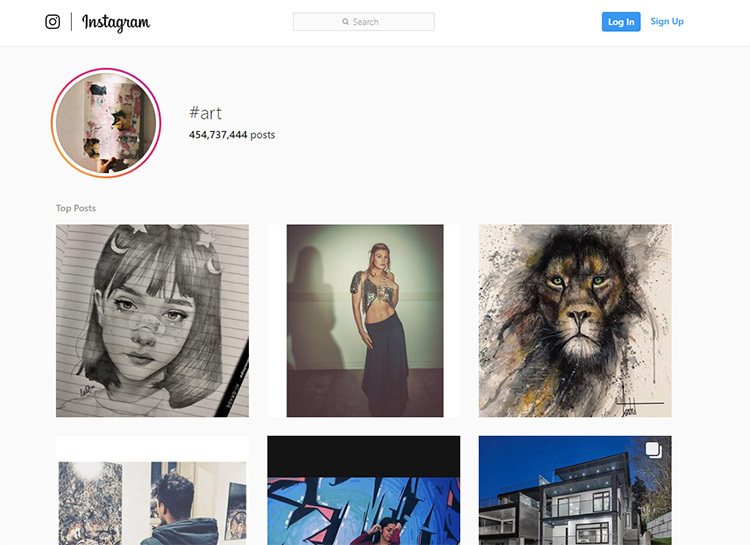 Tons of artists share their work on Instagram along with other fun tidbits about their lives. You can follow individual artists, specific hashtags, or accounts that repost comics from different artists (this is an easy way to get automatic exposure to new comics, by the way). To find comics just search related hashtags in the search bar such as #webcomics, #comics, #comicstrip, #comicseries, etc. Play around with searching different genres and styles to find something you might like. There’s no shortage of amazing webcomics out there but finding and keeping up with the ones you love can feel impossible. Hopefully these sites will streamline your search, provide easy access to great comics, and help you to connect with and support the incredible artists who make your favorite comic series.